Yesterday, I had the radio on, tuned to our local “greatest hits” station, which used to be “Oldies” until some started protesting that Oldies did not (rightly or wrongly) constitute music from the 1980s (personally, I agree). On Sunday mornings, the station has throwback programming in the form of replaying Casey Kasem’s Top 40 countdowns from the 70s. 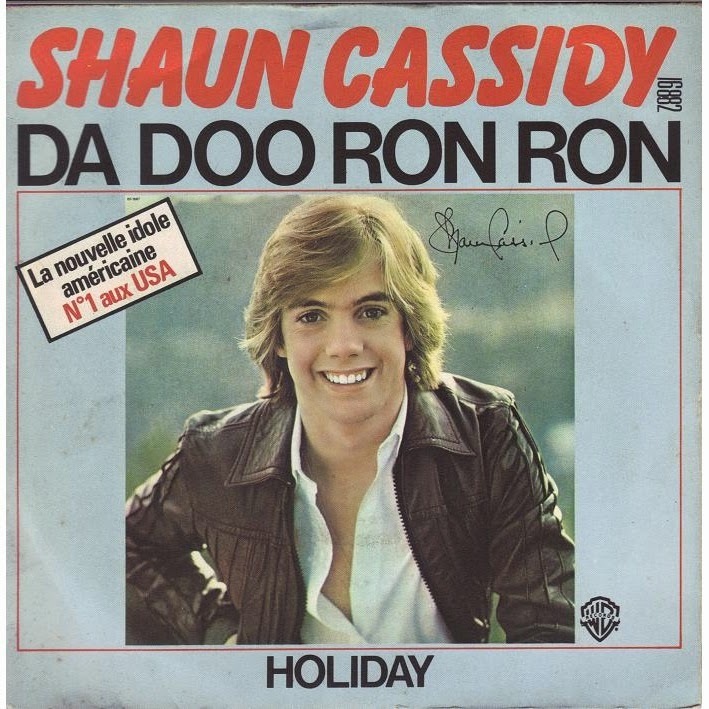 Yesterday, in the top 10 was “Da Do Ron Ron” by Shaun Cassidy, and when I heard it, it threw me straight back to my childhood. I adored Shaun Cassidy as a little girl and couldn’t wait for Sunday nights when I’d sit on the floor in front of the TV and watch every second of The Hardy Boys. I’m convinced this was also the start of my love for mysteries, the seed taking root. Because I adored Shaun, I of course loved “Da Do Ron Ron” and sang it loudly (my apologies to my brother and parents), and yesterday in the spirit of my walk down memory lane, I belted it out in the living room. Fortunately, no one was around to hear it. Me singing loud and proud is not a pleasant experience for anyone but me. But, even if Mr. W and Son #2 and Baby Girl had been around, I still would have sung it out loud. Some music is irrepressible that way. I’m an Oldie, hear me roar. Any Oldies you just can’t help but sing out loud? I made myself a Shaun Cassidy pillow, so I could sleep cuddling him:) Oh to be a Teenager again! If I could have sewn back then, I might have done the same. Love it! I loved Shaun Cassidy too!!!! And speaking of oldies being 80's music. I was with my great niece a while back (she's 16) and she was telling me about this song she was singing for something. She said, "It's an old song, well not OLD like the 80's." Ouch!!! OMG!